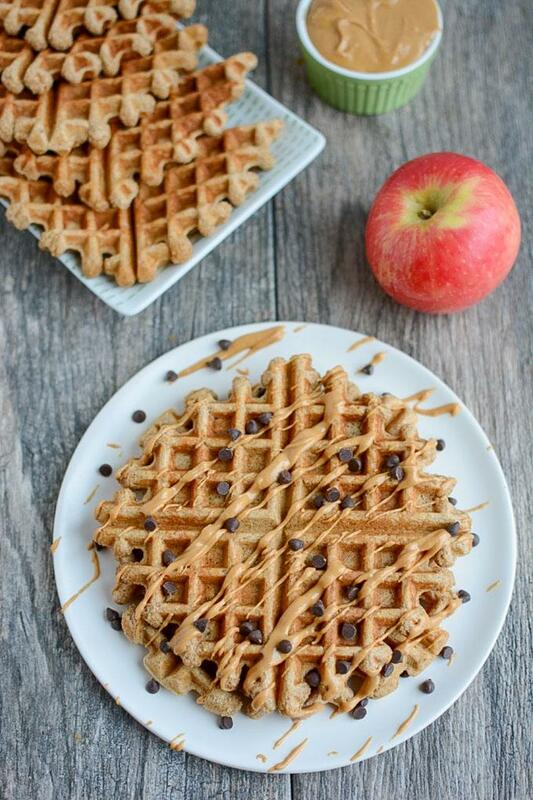 Time for another breakfast idea – Apple Cinnamon Blender Waffles! As you guys know I’m a big fan of breakfast for any meal or snack during the day so please don’t limit waffle hour to just the early morning. My Whole Wheat Yogurt Waffles are my absolute favorite waffles – perfect for making a double batch and freezing them so you have them on hand to pop in the toaster. However, it’s always good to change things up occasionally so I present to you this flavored waffle. Apple cinnamon will forever be one of my favorite flavor combos, but I’m not a huge fan of having chunks of things in my waffles and pancakes. (ie apple chunks, banana slices, etc. I feel like there’s always a little bit of raw batter around the edges of the pieces and that just doesn’t float my boat. So, I whipped out my blender, tossed in all the ingredients and pureed until smooth. Added bonus to using the blender instead of the bowl? When you’re done, just add a little water and dish soap to the blender and let it whirl itself clean! We all know apples and peanut butter make the perfect combo as well so I added some peanut butter to the batter for some healthy fats and protein and I always drizzle more pb on top. Pretty simple right? Note that my waffle maker is not a Belgian waffle maker but I imagine either kind would work just fine! me too! yogurt on pancakes and waffles is so good! Just whipped up a batch of savoury waffles so pesto and cheese for toppings (mix ins?!) never thought to blend it though! Pinning! apple cinnamon is a great combo – love the chocolate chips on top too! SO SO SO WINNING and so so so in the vitamix tomorrow, too. I think waffles are one of the best, easiest recipes in the morning. They are quick, easy and good. It’s one of my staple for sure. Apple Cinnamon is a perfect fall flavor! Definitely going to have to make these … I love the combo of apples and cinnamon. wheee! hope they were great! These look incredible! 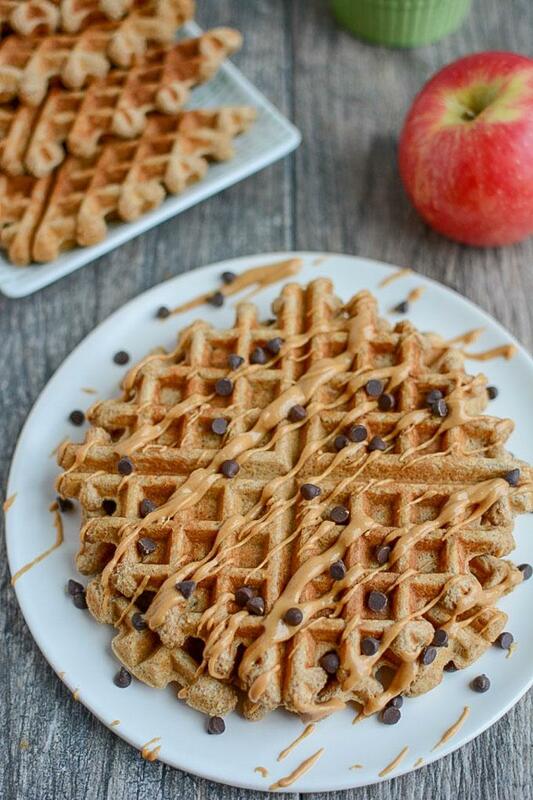 Although I don’t make waffles too often, these are on my list to try ASAP! haha hope you guys enjoy them! I’m a big fan of peanut butter as a topping! love this idea and love the peanut butter on top. I need these now!!! Looks amazing, I’ll definitely be trying this! woohoo! hope they’re a hit! This recipe sounds so yummy. I really like the easy of putting everything into the blender. I will definitely be making these this weekend! I’d freeze these so hard. I can’t stand making brekkie after a long run, but using a toaster oven? I can do that. These look like pure perfection! I am absolutely bookmarking this. Sounds like a good pick-me-up for after the baby arrives and I’m sleep deprived again 🙂 Oh and I think you nailed it with the PB and chocolate chips. You cannot go wrong with PB and chocolate chips. That is genius! You always have a way of making me crave waffles 😉 I think I know what I’m making for breakfast this weekend. Pinning! yay! they’re the perfect weekend breakfast! Those look great! My husband and I have taken to mixing our pancake/waffle batter in our Vitamix bc then we know for sure that everything is mixed haha. We usually use premixed batter, but I’d like to branch out and start trying some of these from-scratch recipes! I love this idea! Great for ‘sneaking’ healthy stuff into food for the kiddos! Oh wow! I’m drooling just looking at these! They look SO good. I’m definitely going to have to make them soon! I love apple cinnamon anything!!! these look amazing! Any tips on how to make them So neat? My never come out okay? I like them whip egg whites in them. Make sure you grease the waffle maker really well before putting batter on it so you can get the waffle out in one piece! Thanks! I try to use a little pam – but am not a fan of it. Is this your favorite waffle recipe or do you have a berry one? I have been using a mix (Kodiak)..
i don’t have a berry one yet. maybe i’ll have to work on that! Thanks for the recipe–never would have thought to add ingredients into a blender but makes complete sense when making these waffles. Also, mmmmm….wafffffles. i can’t believe i haven’t thought of it sooner! so easy! Oh yum!!! I need to try this. Topped with that peanut butter & chocolate chips looks perfect! One day, when I’m craving waffle for dinner (which I don’t see as too far off…) I WILL make these as my next dinner waffles! So easy and nutritious? And sound amazing? Yes, yes, and yes. I wondered why I had not seen post from you. Hope it is all cleared up!!!! Made these this morning and loved them! So simple, delicious, and fool proof. Will definitely make these again. Thank you! I can practically smell these waffles from here! They look fabulous! 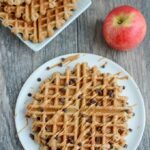 Last night as I was (once again) trying to figure out what to feed my kids for dinner I decided to check my email, and there it was…a fast, EASY recipe for apple cinnamon blender waffles! And since I was already going to dirty the blender, I decided to make a quick batch of smoothies first. Gave the blender a quick rinse, then threw in the waffle ingredients. My kids LOVED them. I’m glad I decided to make a double batch because they asked for them again for breakfast this morning! The only change I made was to use cashew butter (due to a peanut allergy). We will definitely be making these again! awwww yay! i’m so glad they were a hit!! Is it ok to omit the peanut butter? Best waffles I have ever tasted highly recommend, the apple taste made this recipe even more superb. I recommend using applesauce as a topping. [WORDPRESS HASHCASH] The comment’s server IP (54.193.67.233) doesn’t match the comment’s URL host IP (199.27.76.207) and so is spam.